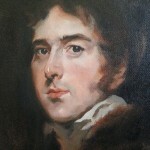 Mastercopy of Thomas Lawrence’s William Lamb, 2nd Viscount Melborne. 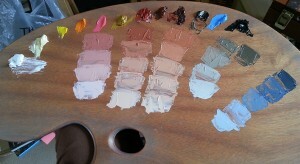 This palette is also similar to the one Lawrence recommended to his students. There is more information on Lawrence’s studio practice on the NPG website. 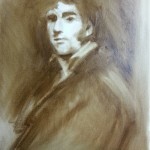 I utilised value strings on this one too – I found that they helped me to target the value fairly quickly and then adjust the hue and chroma within that value, which simplified colour mixing. * Yes, there area few other colours there…for other paintings. With the first Lawrence I found it harder to match his colours using a contemporary palette so I wasn’t tempted by cadmiums, although I might have dipped into the King’s blue. I’m a little suspicious of value strings as I think they can lead to over-reliance on white to lighten values, leading to chalkiness, or encourage me to see through the lens of value strings, thus conforming what I see to that pattern. Here I did see the benefit as this palette offers few alternatives it seemed to heighten the chromatic impact of the effects of those mixes. In comparison with my first copy I knew what problems I was likely to encounter and had a better idea of how to solve them. In particular I new that this was a slow burn project for me and would be completed in a somewhat meditative way; many sessions over a fairly long period of time. Even so I still found such a prolonged project frustrating. I don’t think this project is as successful as my previous copy, I did not have the same affinity with this painting, I think the Sarah Trimmer painting was brought to a much higher level of resolution. 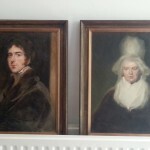 I did not appreciate the scale of difference and corresponding effort between the two painting before copying them. 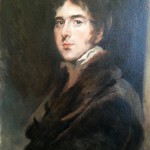 Overall this copy convinced me that my painting had progressed since the previous copy, both in executing it and notably elsewhere (I will post that in due course). Not everyone is a fan of doing master copies, it can become a constraint as much as a tool but I think it depends entirely on the approach. I felt like I was trying to find out from a very taciturn teacher how they thought and saw their subject, trying to grasp the shapes of the ideas they were using from the decisions they made. Of course it’s better to have a real teacher, in front of a real model. Of course you can ask your questions from life, a real subject or still life but there is something about the questioning process. The dialogue is hard to conduct with yourself, the imperative to think in terms which are foreign to you and to see with different eyes; I think that is the real point of the exercise.